Disclosure Agreement: Review was due to compensation from the company’s whose products were reviewed. We Dish Nutrition tested each product thoroughly and gives high marks to only the very best. Opinions expressed at We Dish Nutrition are our own. True or False: There is healthy and unhealthy popcorn? This is true! While traditional microwave popcorn has been linked to higher cancer risks, Quinn Popcorn has reinvented the term “popcorn.” Everything from the compostable bag and no chemical liners used in Quinn Popcorn’s line of Pure Pop Bags does not contain chemical coatings and metalized plastic heating elements. In comparison to Quinn Popcorn, traditional microwave popcorn requires engineered ingredients to withstand higher temperatures needed to activate a metalized polymer film that absorbs microwaves and converts them into heat, called a susceptor. With the susceptor, the heat of the microwave can go beyond the traditional 212F of heated water, limiting the number of unpopped kernels. 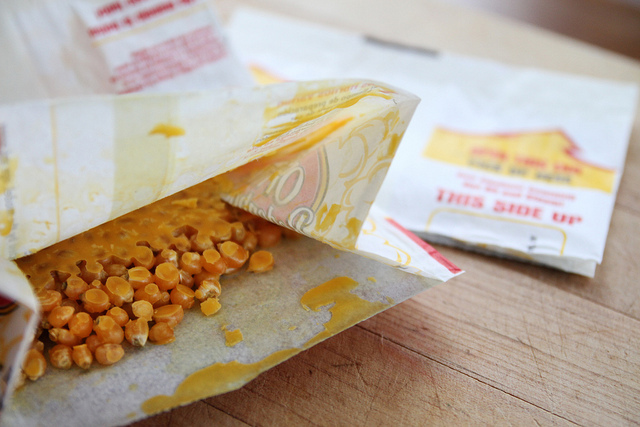 Secondly, traditional microwave popcorn bags are coated with kraft paper, which repels fats. This is concerning as the kraft paper contains perfluoroctanoic, a carcinogen that can impact immune system, liver and become a toxicant. Thankfully, Quinn Popcorn is part of the non-GMO project, obtaining ingredients from Vermont’s Maple Sugar, without preservatives while using organic corn and BGH Free dairy. The best part? Quinn’s creative flavors and options of popcorn! With options like Kale and Salt, California Olive Oil, Cheddar and Chipotle and made with Coconut Oil, Quinn Popcorn has covered all the bases in flavor. Yet, is it too much to think in the future they’ll introduce a flavor that meets taste buds that enjoy sweets? Seeing how transparent Quinn Popcorn is in their entire production of popcorn, it makes me wish more companies allowed us to see the start to finish product. By inputting your Batch Number into Quinn’s site, you can see step by step what it took to make your bag of popcorn. This initiative is perfectly called, Farm-to-Bag! I’m so glad I stumbled upon Quinn Popcorn as it means I don’t have to give up bagged popcorn altogether! Have you checked out Quinn Popcorn? What’s your favorite flavor?